[EDIT] above image has been updated with Dec 2015 data. An approximately periodic variation was noted in the data, in the rough form of a rectified sine wave. In order to avoid corrupting the average slope calculations by spanning from a peak to a trough in this pattern, a mathematical sine function was adjusted manually to approximate the period and magnitude shown in the data. It was noted that, despite the break of this pattern in the early 2000’s, the phase of this pattern is maintained until the end of the record and aligns with the post-2007 segement. However, there was a notable drop in level ( about 0.5×10^6 km^2 ). 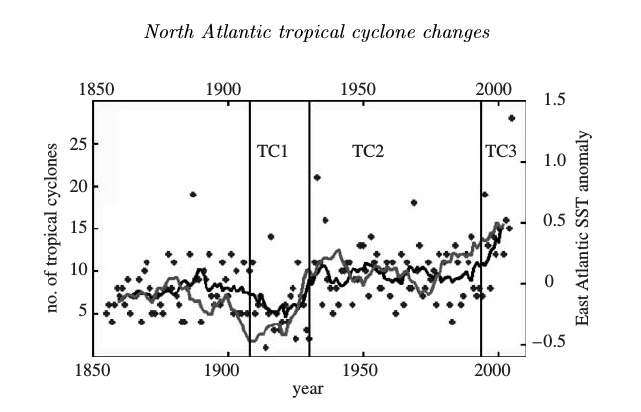 Labels indicate the timing of several notable climate events which may account for some of the deviations from the observed cyclic pattern. These are included for ease of reference without necessarily implying a particular interpretation or causation. Here the typical cycle of seasonal variation for the period was estimated by fitting a constant plus 7 harmonic model to the data ( the 7th being about 52 days ). This is similar to the technique descrobed by Vinnikov et al . The residual difference between the data and this model was then taken as the anomaly for the segment and low-pass filtered to remove 45 day (8th harmonic) and shorter variations. Understanding of “beats” and amplitude modulation requires going back to basics to distinguish two similar treatments that are often confused with one another. If a physical system contains modulation as expressed by the multiplication on the left of the equation, spectral analysis will split things into a series of additive components and we will have to interpret what we find in the spectrum as being the sum and the difference of the physical frequencies that are modulating each other. So the presence of two frequencies seen in a Fourier spectrum is equivalent to physical modulation of their average frequency by half the difference of their frequencies. This is a mathematical identity, the two interpretations are equivalent and interchangeable, thus this is totally general and independent of any physical system where this sort of pattern may be observed. If these kind of patterns are found, the cause could be either a modulation or superposition. In the presence of perfect sampling, the two forms are mathematically identical and again what would be found in the spectra would be the left-hand side: the two additive signals. However, what happens to the modulating envelop on the right in the climate system may well mean that the faster one get smoothed out, or the sampling interval and all the averaging and data processing breaks it up . The longer, lower frequency signal may be all that is left and then that is what will show up in the spectrum. This is similar to what is called “beats” in an acoustic or musical context, except that the ear perceives twice the real physical frequency since human audition senses the amplitude variation: the change in volume, NOT the frequency of the modulation. The amplitude peaks twice per cycle and what we hear as two “beats” per second is a modulation of 1 hertz. Care must be taken when applying this musical analogy to non-acoustic cycles such as those in climate variables. Also, if one part ( usually the faster one ) gets attenuated or phase delayed by other things in climate it may still be visible but the mathematical equivalence is gone and the two, now separate frequencies are detected. Since the ‘side-lobe’ frequencies are symmetrically placed about the central frequency, this creates a symmetric pair of frequencies of equal magnitude whose frequencies are the sum and the difference of the originals. This is sometimes referred to as a ‘doublet’. If the two cosine terms are equal as shown above, neither of the original signal frequencies remain. However, if the higher frequency is of larger amplitude, a residual amount of it will remain giving rise to a ‘triplet’ of frequencies. This is what is usually done in radio transmission of an amplitude modulated signal (AM radio). In this case the central peak is usually at least twice the magnitude of the each side bands. It can be seem mathematically from the equations given above, that if both inputs are of equal amplitude the central frequency will disappear, leaving just a pair side frequencies. It may also be so small as to no longer be distinguishable from background noise in real measurements. All of this can confound detection of the underlying cycles in a complex system because the periods of the causative phenomena may be shifted or no longer visible in a frequency analysis. There are many non-linear effects, distortions and feedbacks that will deform any pure oscillation and thus introduce higher harmonics. Indeed such distortions will be the norm rather than a pure oscillation and so many harmonics would be expected to be found. As a result, even identifying the basic cause of a signal can be challenging in a complex system with many interacting physical variables. The triplet is useful pattern to look for, being suggested by the presence equally spaced frequencies, although the side peaks may attenuated by other phenomena and are not always of equal height as in the abstract example. Examples of these kind of patterns can be found in variations of Arctic ice coverage. Running means are often used as a simple low pass filter (usually without understanding its defects). Often it is referred to as a “smoother”. In fact it does not even “smooth” too well either since it lets through enough high frequencies to give a spiky result. Running means are fast and easy to implement. Since most people have some understanding of what an average does, the idea of a running average seems easily understood. Sadly it’s not that simple and running averages often cause serious corruption of the data. So it smooths the data to an extent, but what else does it do? The problem with an evenly weighted average is that the data is effectively masked by a rectangular window. The frequency response of such a rectangular window is the sinc function  and thus the effect on the frequency content of the data is to apply the sinc function as a frequency filter. The sinc function oscillates and has negative lobes that actually invert part of the signal it was intended to remove. This can introduce all sorts of undesirable artefacts into the data. 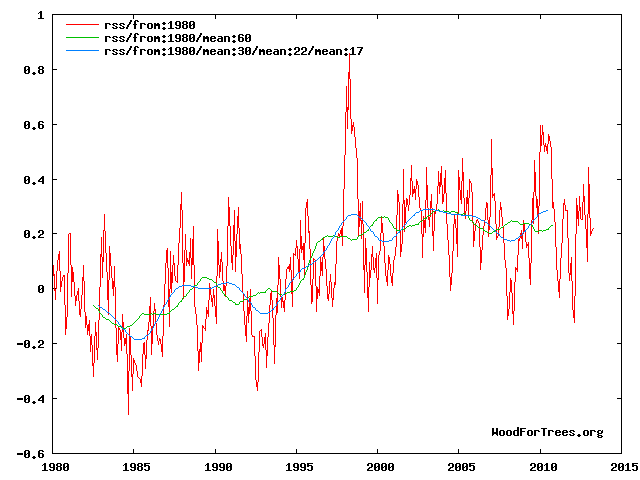 Figure 1 Comparing effects of different filters on a climate data time series ( 60 month running mean vs 30m triple running mean [blue] ). It can be noted that the peaks and troughs in the running mean are absolutely wrong. When the raw data has a peak the running mean produces a trough. This is clearly undesirable. The data is “smoother” than it was but its sense is perverted. This highlights the difference between simply “smoothing” data and applying appropriately chosen low-pass filter. The two are not the same but the terms are often thought to be synonymous. Some other filters, such as the gaussian, are much more well behaved, however a gaussian response is never zero, so there is always some leakage of what we would like to remove. That is often acceptable but sometimes not ideal. figure 2 showing the magnitude of the frequency response. However, it should be noted that the sign of every other lobe of running mean is negative in sign, actually inverting the data. Below is a comparison of two filters ( running mean and gaussian ) applied to some synthetic climate-like data generated from random numbers. Click to see the full extent of the graph. Figure 3. Showing artefacts introduced by simple running mean filter. As well as the inversion defect, which is again found here around 1970, some of the peaks get bent sideways into an asymmetric form. In particular, this aberration can be noted around 1958 and 1981. In comparing two datasets in order to attribute causation or measure response times of events, this could be very disruptive and lead to totally false conclusions. Another solution is to improve the running mean’s frequency response. The sinc function has the maximum of the troublesome negative lobe at πx=tan(πx). Solving this gives πx=1.4303 πx=1.3371….. However, simply targeting the peak in the lobe does not produce optimal results. Reduced values leave less residual. Now if a second running mean is passed after the first one with a period shorter by this ratio, it will filter out the the inverted data…. and produce another, smaller, positive lobe. A similar operation will kill the new lobe and by this stage any residual problems are getting small enough that they are probably no longer a problem. The triple running mean has the advantage that it has a zero in the frequency response that will totally remove a precise frequency as well letting very little of higher frequencies through. If there is a fixed, known frequency to be eliminated, this can be a better choice than a gaussian filter of similar period. The two are shown in the plot above and it can be seen that a triple running mean does not invert the peaks as was the case for the simple running mean that is commonly used. It can be seen the second stage is pretty accurate but the final one is rather approximate. However, the error is not large in the third stage. Figure 4. Comparing frequency response of gaussian and triple running mean filters. Another advantage is that the data from r3m filter really is “smooth” since it does not let past some high frequencies that a simple running mean does. If the aim is simply to “smooth” the data, rather than target a specific frequency, a r3m filter with half the nominal width often gives a smoother result without losing as much information, as was shown in figure 1. This defect in the smoothing can be seen in the example plot. For example, there is a spike near 1986 in the simple running mean. Worst of all this is not even a true spike in the data that is getting through the filter, it is an artefact. 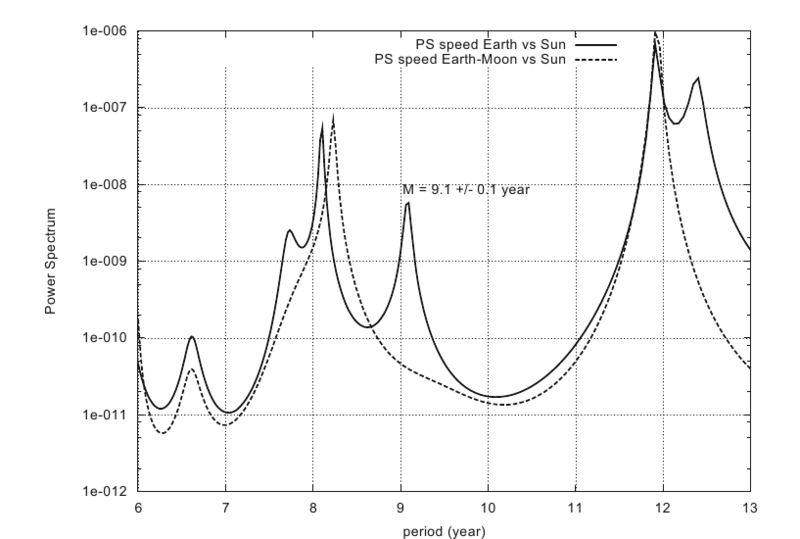 In 2004, Svalgaard et al published a prediction of the cycle 24 peak . That prediction has proved to be remarkably accurate. It would be even more remarkable if SIDC were to apply a “smoothing” filter that did not invert and displace the peak and reduce its value. smallest cycle in the last 100 years. SIDC processing converts a later trough into the peak value of cycle 24. The supposed peak aligns with the lowest monthly value in the last 2.5 years of data. Clearly the processing is doing more than the intended “smoothing”. The filter used in this case is a running mean with the first and last points having reduced weighting. It is essentially the same and shares the same defects. Apparently the filter applied to SIDC data was introduced by the Zürich observatory at the end of the 19th century when all these calculations had to be done by hand ( and perhaps the defects were less well understood ). The method has been retained to provide consistency with the historical record. This practise is currently under review. While it may have been a reasonable compromise in 19th century, there seems little reason other than ignorance of problems for using simple running mean “smoothers” in the 21st century. Referring to a filter as a “smoother” is often a sign that the user is seeking a visual effect and may be unaware that this can fundamentally change the data in unexpected ways. Wider appreciation of the corruption introduced by using running mean filters would be beneficial in many fields of study. SIDC applies a 13 point running mean with first and last points weighted 50%. This is a slight improvement on a flat running mean but shares the same tendancy to invert certain features in the data. The main object of this article was to raise awareness of the strong, unintentional distortions introduced by the ubiquitous running mean “smoother”. High-pass filters may be used, for example, to isolate sub-annual variability in order to investigate the presence or absense of a lunar infulence in daily data. The following points arose in discussion of the article. Vaughan Pratt points out that shortening the window by a factor of 1.2067 (rather than 1.3371 originally suggested in this article) reduces the stop-band leakage. This provides a useful improvement. Further optimisation can be attained by reducing negative leakage peaks at the cost of accepting slightly more positive leakage. Since the residual negative peaks are still inverting and hence corrupting the data, this will generally be preferable to simply reducing net residuals irrespective of sign. The Pratt configuration and the asymmetric 3RM result in identical averaging intervals when set to remove the annual cycle from monthly data. Both result in a choice of 8,10 and 12 month windows. The difference will have an effect when filtering longer periods or higher resolutions, such as daily data. If this is implemented in a spreadsheet, it should be noted that each average over an even interval will result in a 0.5 month shift in the data since it is not correctly centred. In a triple running-mean this results in 1.5 months shift with respect to the original data. In this case the 1.3371 formula originally suggested in the article, giving 12,9,7 month averages and producing just one 0.5 month lag, may be preferable. None of these issues apply if the scripts provided accompanying the article are used, since they all correctly centre the data. A more technical discussion of cascading running-mean filters to achieve other profiles can be found in this 1992 paper, suggested by Pekka Pirilä and should serve as a starting point for further study of the subject. 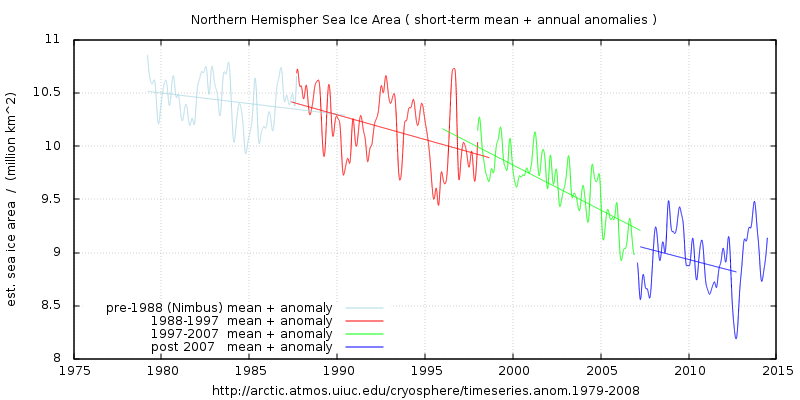 To understand the processes driving polar ice coverage it is necessary to identify cyclic variations. 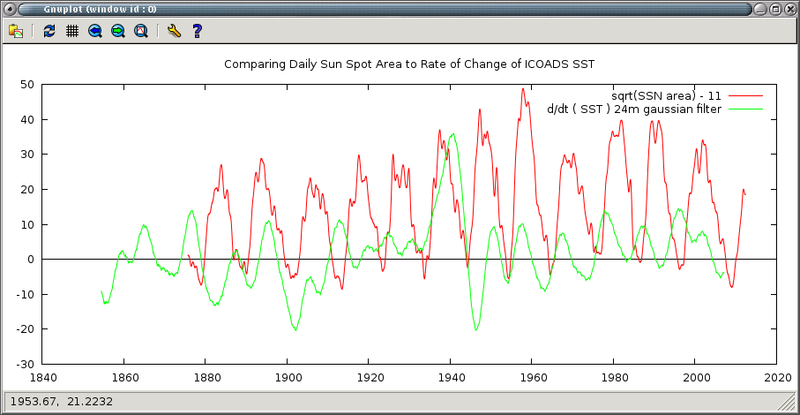 Some would wish to trivialise climate into AGW plus random “stochastic” variability. This is clearly unsatisfactory. Much of the variation is more structured than may be apparent from staring at the ups and downs of a time series. There are many cyclic or pseudo-cyclic repetitions and before attempting to regression fit a linear trend to the data, it is necessary to identify and remove them or include them in the model. Failure to do this will lead to concluding invalid, meaningless “trends” in the data. 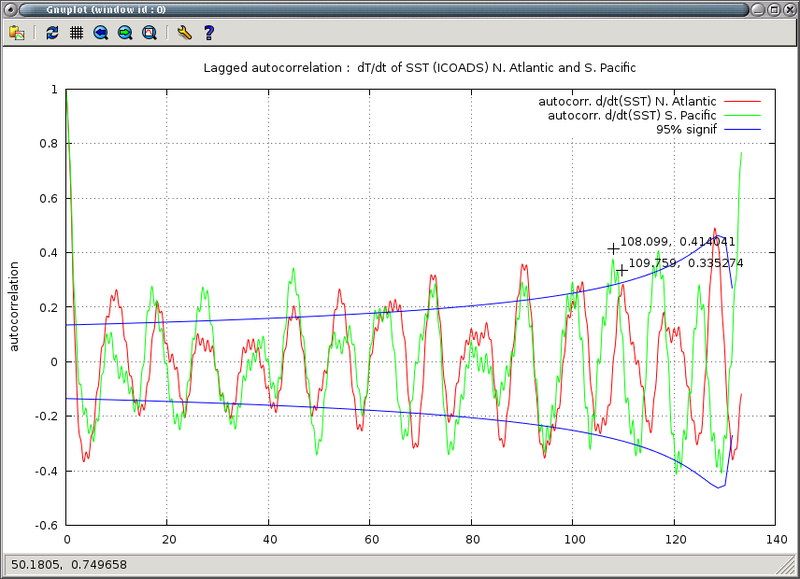 See cosine warming ref 1. 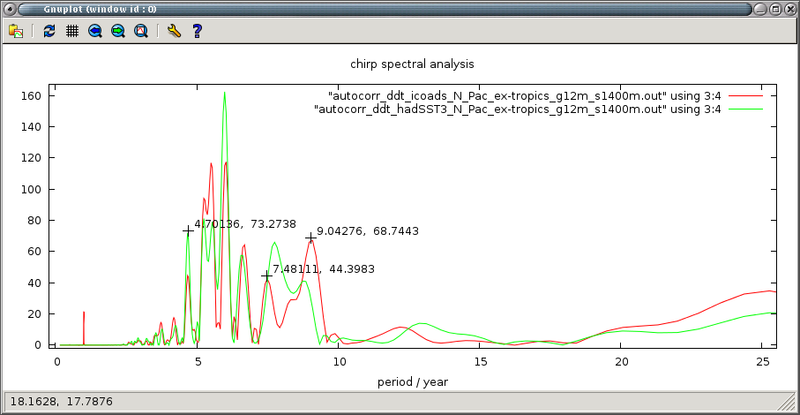 One means of testing for the presence of periodicity in a dataset is spectral analysis. 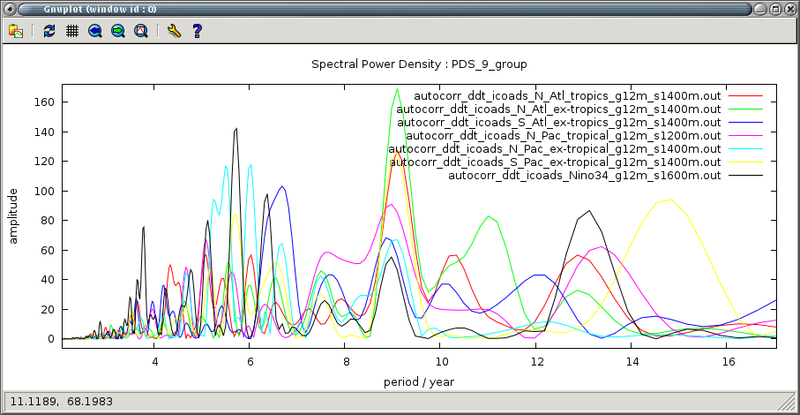 In particular spectral power distribution can be informative. 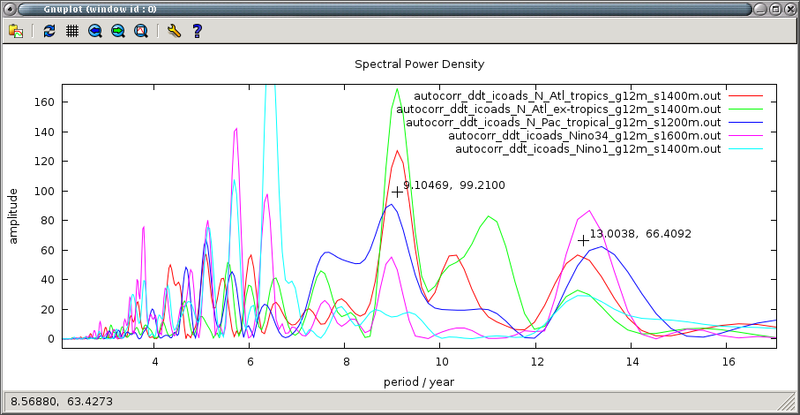 The power spectrum can be derived by taking the Fourier transform of the autocorrelation function. The latter is, in its own right, useful for identifying the presence or not of cyclic change in the data. One condition to get useful results from Fourier analysis is that the data should be stationary (ref 1) . Amongst other things this requires that the mean of the data should be fairly constant over time. FT of a series with a rising/falling trend will produce a whole series of spurious peaks that are a result making an infinite series from a ramping, finite sample. If a time-series is found not to satisfy the condition of stationarity, a common solution is examine instead the rate of change. This is often more desirable than other ‘detrending’ techniques such as subtracting some arbitrary mathematical “trend” such as a linear trend or higher polynomial. Unless there is a specific reason for fitting such a model to remove a known physical phenomenon, such a detrending will introduce non physical changes into the data. Differencing is a linear process whose result is derived purely from the original data and thus avoids injecting arbitrary signals. The time differential ( as approximated by the first difference of the discrete data ) will often be stationary when the time-series is not. For example a “random walk”, where the data is a sequence of small random variations added to the previous value, will be a series of random values in its differential and hence stationary. This is particularly applicable to climatic data, like temperature, where last year’s or last month’s value will determine to a large extent the next one. This kind of simple autoregressive model is often used to create artificial climate-like series for testing. To ensure there is no step change, as the end of the data is wrapped around to the beginning, it is usual to also apply a window function that is zero at each extreme and fades the data down at each end. This has the disadvantage of distorting the longer term variations but avoids introducing large spurious signals that can disrupt the whole spectrum. Most window functions produce some small artificial peaks or ‘ringing’ either side of a real peak. Some do this more than others. The choice of window function depends to some extent on the nature and shape of the data. The choice is often a compromise. As a first step the annual cycle was removed by a triple running mean filter (ref 4) with a zero at 365 days and designed to avoid the usual distortions caused by simple running mean “smoothers”. If a Fourier transform were to be done with the presence of the annual cycle, it’s magnitude, at least an order of magnitude greater than anything else, would reduce the accuracy of FFT and also introduce noticeable windowing artefacts in the 0.5 to 2.0 year period range. For this reason it was removed. The adf.test() function in R package returned values indicating it was not possible to assume that the data was stationary. Contrariwise, the test on the derivative of the time series indicated strongly that it was stationary. Non-stationarity is probably caused by long term trend or long period cyclic variation (long relative to the duration of the dataset). Taking rate of change reduces linear trends to a constant and attenuates the amplitude of long periods by an amount proportional to the frequency, making it more amenable to analysis. The 365d filter will also attenuate frequencies less than about 5 years and this needs to be born in mind or corrected for when relative magnitudes are considered in the spectrum. ref1 stationarity reqt for FFT. This is also important since most of what climate science refers to as “forcings” are power terms measured in W/m2 . Temperature is a measure of energy, so it is the rate of change of temperature that reflects power. If there is a change in radiative ‘forcing’ such as solar or CO2, the response will be instantaneous in rate of change, however the subsequent change in temperature will take time to accumulate before it becomes evident, by which time some other factors have probably already obscured or confused the signal. He calculated the following periods: 5, 5.2, 5.4, 5.6, 5.9, 9.3, 10, 10.8, 11.8, 13, 20, 23.6 , 65.6 and 131 years in sun-spot number. Useful and highly interesting paper by Ian Wilson showing the planetary origins of many of these peaks. Figure A1. 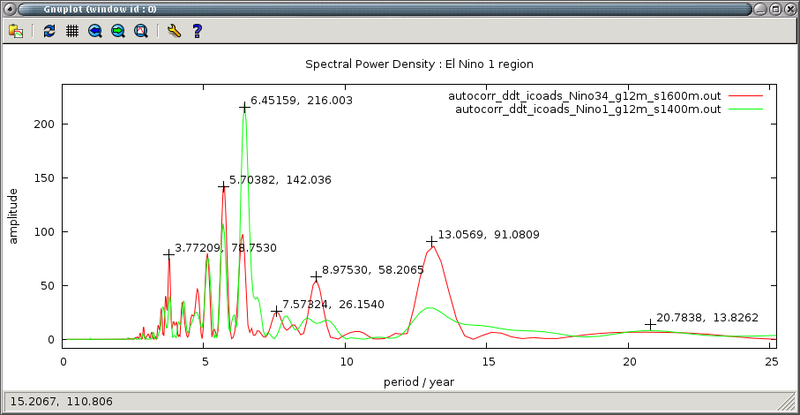 showing comparison of HadSST3 and ICOADS power density spectrum for extra-tropical North Pacific. 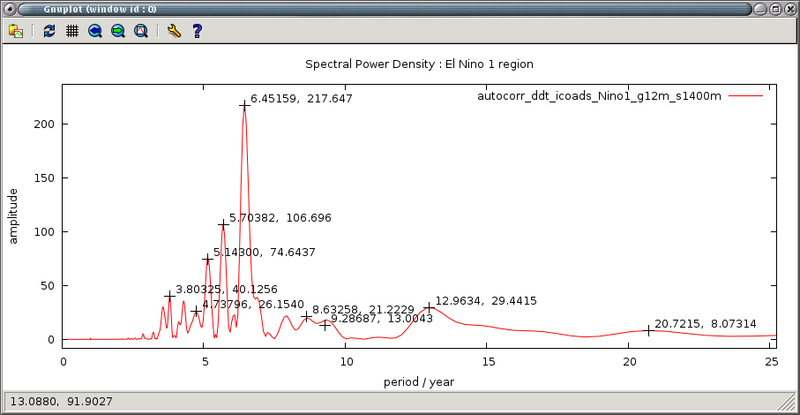 Spectra are similar, but with significant differences between 7 and 9 years.